Specially designed to support women from the early post natal period. It’s yoga for YOU, but baby comes too for some special time together, breathing, moving and relaxing. So often all of your energy is focused on looking after your newborn at a time when it is so important to look after yourself. Yoga postures that restore energy and release tension in the neck, shoulders and back. Supported, gentle movements and breathing to gently reconnect with the deep abdominal muscles and pelvic floor. Relaxation, time to nourish tired bodies and minds and bond with your baby. Time to meet other local women and share experiences. We don’t mind if you are still in your PJ’s! Just come along and let us look after you. You are welcome to feed, change baby and simply do whatever you need to throughout the class. Suitable for women who have recently given birth, including those who had a c-section. 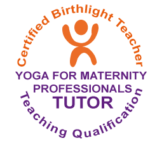 You can join these classes as soon after your birth as you feel ready. You are welcome to use any class credits remaining from pregnancy yoga. These classes are taught by Helen Macnair who has been working with women and their new babies for over 20 years.